As usual, I really like looking at the hi-res versions of these pictures to see what's interesting on each boat's Crew's Mess. In this one, I noticed that 1) the JOs at the forward portside table don't seem to be paying attention as intently as the CPOs in the audience, and 2) the sub seems to have an actual replica Springfield rifle hanging from the overhead. I'm assuming the rifle comes down before they try any angles and dangles. It also looks like the Master Chief is wearing a ESWS pin under his Dolphins. Pretty gutsy to wear that on a sub. Notice the License plate for the great state of Illinois in the upper right corner. No "Naga" on the benches.. Is that how we get em through the chow line even faster now days, make it even more uncomfortable? I'm browsing some of the lds/mormon blogs, and your title cracked me up! However, I am not afraid to admit that the content is over my head! I have a brother-in-law I'm going to refer it to though - he's a rocket scientist, and loves this sort of stuff. Yep, looks like a Springfield 03/A1 30-06 to me. In the background in whites is MC Billy Cramer, our COB on the SFO when we crashed, word has it, he's the next FORCECM. Billy is no doubt one of the best COB's I have ever seen! I'm sure the rifle is secured very tightly. The Louisville has an old musket on the wall in the wardroom. I used to try and figure out a covert way to remove it from its roost. Nothing short of a grinder would have been sufficient to remove it. It is most assuredly NOT a 1903. It isn't even a bolt action. It might be an old Trapdoor, but it looks more like a Civil War era muzzle loader. USS Constitution's 1812 Marine Guard fire vintage Springfield flintlock muskets during the ship's underway. "Old Ironsides" was underway for the "Constitution Day Cruise,"
Also if you go here: http://www.navy.mil/view_single.asp?id=10918 you can see that four years ago it was pointed the other way and secured much better. And the salad bar was being used as a podium back then too. Bubblehead - like you, I enjoy these. The thing that gets me about both these pics - the force and the MCPON one - is the physical barrier they've put up between themselves and their audience. They're not "talking with the crew" these guys are standing behind their desks. Why do they need the protective barrier or big ol desk? Is it because they are defending a policy they really don't agree with? Is it because of some heightened sense of importance and ego? Are they just more comfortable that way? Back to MCPONs and such... 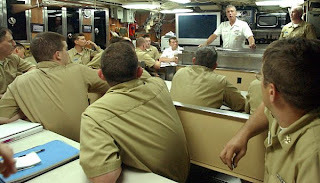 I remember a visit to the command by MCPON Hagan. The only thing I remember about it was that he never let a single Sailor complete a question from start to finish...My impression... you see the MCPON, has heard ALL the questions Sailors might have, and therefore has ALL the answers before they get the question out. It was quite disappointing to see that in our top Chief. Several years in the Fleet Reserve now, I hope this generation is better. Hey fod - the reason they have that "big barrier" between them and the audience is because they're on a frickin SUBMARINE and there's no other place to stand in front of the crew! As it is the most they can get on the mess decks is 30-40 people. Would you rather have them in formation on the pier and competing with crane noise and wind? Cut the mcpon some slack - at least he's out there taking the questions! Slack given. I was simply trying make a point about the photo. It appears that in my attempt at nuance, I failed to communicate that point effectively. "... at least he's out there taking the questions!..." As far as taking questions, Go back to the MCPON photo, take a close look at the body language. Does that look like a man ready for two-way dialogue? That could be any CMC, standing with his Sailors on any platform. What it is not however, is a Chief in "listening" mode. The CNO is telling them something, and they better be listening. Compare his stance to the Force and the COB in the second photo. While it may be the "Most Effective Use of a Soup & Salad Bar as a _Lectern_" it isn't a podium--a podium is a platform upon which one stands.